Koa Ridge broke ground November 2, 2017, construction on the first homes expected to start late 2018 with the first homes completed sometimes in year 2019. For more information please call Michelle Johnson (RA) at (808) 352-2469 or email Michelle@HawaiiLiving.com. Koa Ridge is a master-planned community, which, when build out (estimated 10 to 12 years) will include ~3,500 properties within a walkable community, and include single- and multi-family homes, a medical center, a hotel, light industrial, parks, an elementary school, a recreation center, churches and open space. The project will also include a center called the Village Center, which is the center of the project with shopping, dining and entertainment options. Around 2,500 jobs may be created from Koa Ridge. 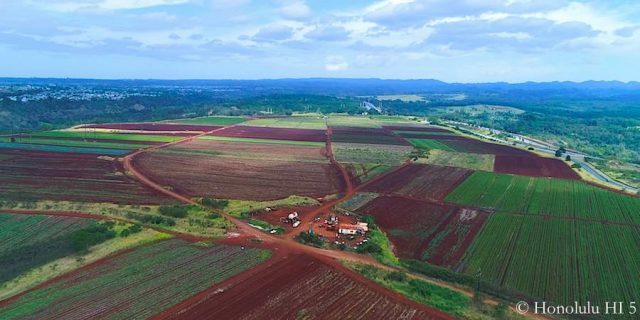 Koa Ridge is a new residential development, which will be located on 768 acres of agricultural land in Central Oahu between Waipio and Mililani Town – across Ka Uka Blvd from Costco (see Koa Ridge location on Google Map). Since the original Koa Ridge plan year 2002, the developer has now increased the number of multi-family homes and the single-family homes will be build on smaller lots to regain affordability in an expensive market with high construction costs. The project will also add a commercial component with mixed-use units, where people can live upstairs and use 1st floor for commercial use. Project was originally proposed more than 15 years ago and approved by the State Land Use year 2002. However, legal challenges from opponents (arguing against using the agricultural land for housing) kept the project in limbo until April 2016 when the Hawaii Supreme Court gave the green light for Castle & Cooke Hawaii to develop Koa Ridge. The project is expected to cost developer around $2,000,000,000 ($2BL). No details yet. However, Castle & Cooke Hawaii President was quoted April 2016 saying they expect average home prices to be more than $700,000 (we assume this price point is for market price units). About 30% of the homes will be affordable housing.